(UPTOWN CHARLOTTE, NC) - Earlier today at a press conference held at BB&T Ballpark, the Charlotte Knights announced the signing of Timothy "Eli" Shenise to a one-day contract. 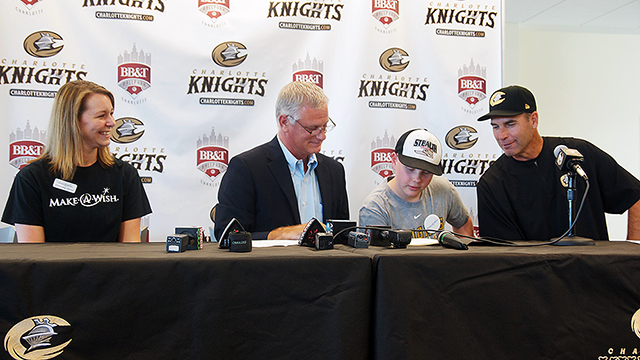 Shenise, a 12-year-old boy from Pineville, NC, signed the one-day contract at BB&T Ballpark in front of family, friends, members of the media, and Charlotte Knights players and staff members. Sunday's special announcement was made with help from Make-A-Wish®. Eli is currently battling Burkitt's Lymphoma, a cancer of the lymphatic system. He has successfully completed two rounds of treatments, and is continuing to stay strong for the final two rounds. Eli's wish was simple - he wanted to become a Charlotte Knights player for a day. That wish was granted when Charlotte Knights Chief Operating Officer Dan Rajkowski, along with Knights manager Joel Skinner, presented Shenise with a one-day contract to play for the Charlotte Knights. Once the contract was signed, Eli was taken down to the Knights clubhouse where he had his own locker with his own jersey waiting for him. The jersey, which featured his name and number 37, was a perfect fit. Throughout the course of the day, Shenise will practice with the team and later take the field as the team's first baseman in the 7:05 p.m. game against the Gwinnett Braves. Knights players will wear bright green ribbon wristbands during Sunday's game, which stands for all forms of non-Hodgkin's lymphomas. Make-A-Wish® Central and Western North Carolina grants wishes to children with life-threatening medical conditions to enrich the human experience with hope, strength and joy. Since its inception in 1985, more than 3,500 local children have experienced a wish come true. For more information visit: www.nc.wish.org.